It is also a teaching centre, ensuring the continuity of skills and knowledge of a variety of tapestry-related activities present in the Creuse region, from the raising of sheep and the spinning and dying of wool, to the creation of images and their weaving into an extraordinary array of contemporary tapestries. One such work is currently underway in France-Odile Perrin-Crinière’s workshop-gallery A2, located in the centre of Aubusson. Even before the start of the project to create a multi-purpose building for the public, the Cité Internationale has since 2010, supported the work of local artists and artisans in the development of contemporary creations. Each year the Cité announces a call for projects from artists and designers around the world based on a specific theme. Three projects are then selected, after which workshops in Creuse are commissioned to create the tapestry. Perrin-Crinière received the commission last year to weave a richly coloured 3m x 5m tapestry called The Family in the Joyful Greenery based on an image by the Argentinian artists Leo Chiachio and Daniel Giannone. Enter her workshop-gallery and you will see two (or three if Perrin-Crinière herself is at the loom) highly-skilled craftswomen leaning over a long horizontal loom, working with patience, skill, passion and camaraderie before a web of yarns, knots and colours (300 in all). They have been working on it for over a year now, with another year ahead of them before the tapestry “falls” from the loom, weaving without even seeing the actual face of the tapestry since it is woven from the back. Perrin-Crinière’s route to becoming the master artisan at the helm of a well-established workshop began in 1978 when, at age 16, she left her home in the Landes region to learn tapestry-making at Aubusson. After three years of school- based training and several more during her first professional job, she struck out on her own as a creator-weaver, meaning that in addition to following the designs of others she would weave her own designs. In 2010 she partnered with another weaver to create the workshop A2 but the unexpected early retirement of her partner left Perrin-Crinière alone, just as the major commission from the Cité arrived. In need of employees she turned to the formal training programme at Aubusson (a two-year programme run since 2010 by the Cité), hiring two weavers, or lissiers, whose entrance into the field was quite different from her own. Patricia Bergeron, a Creuse native, had a long career assisting the elderly behind her before beginning her conversion to a professional weaver. Aiko Konomi knew of Aubusson from her native Japan, where she received a master’s degree in contemporary art fabrics. She arrived in 2014 to study in the Cité’s programme but for financial reasons and because of her prior experience working towards her master’s degree, she only completed one year of the programme before Perrin-Crinière hired her with a professional contact. Bergeron and Konomi now work daily on the tapestry while Perrin-Crinière puts in time here and there since she also works on other orders and teaches weaving workshops. She remains a creator of her own designs, those that marry colour and material, such as a tapestry framed by slate. Whether creating the image or not, she insists on the importance of initiative and interpretation for the artisan, who imbues the tapestry with her own appreciation of colour. The A2 workshop has earned the label Entreprise du Patrimoine Vivant (Living Heritage Company, or EPV) from the French State, in recognition of the excellence of the traditional and industrial skills represented by Perrin-Crinière and her workshop. A pretty 10km drive south through the wooded valley from Aubusson, leads to Felletin, a small town of 1800 inhabitants, less than half the size of Aubusson. If Aubusson is the tapestry capital, Felletin is where it began, since tapestry work has been documented here from the middle of the 15th century, even before Aubusson. More than 500 years later, Felletin remains a force in the Aubusson tapestry industry (which encompasses the department of Creuse). The tennis-court size tapestry at Coventry Cathedral, designed by the British artist Graham Sutherland and completed in 1962, was made on a single loom in Felletin by Pinton, one of the largest manufacturers in the region. While Perrin-Crinière was half-way through her commission at A2, Catherine Bernet, founder of Atelier Bernet, was cutting the pompoms on the back of a tapestry that “fell” from its loom after two years of weaving and will be one of the first pieces visitors see as they enter the new museum. She was finally able to see her work face on this spring. But no sooner had the bubbly been drunk (in the presence of the artists) then it was turned over again so that she could set to work bunching and cutting the pompoms on the back. Bernet works in the attic of a house in Felletin, with plenty of natural light. She works with two employees, one young weaver whom she employed freshly graduated from the Cité weaving programme and another with 35 years of experience. Originally from nearby Auvergne, Bernet came to tapestry-making in 2010, at the age of 34, having begun her working life as a pharmacist. Having given that new interest time to mature in her mind, she crossed the border from the Auvergne to the Creuse and from pharmacy to craftsmanship. It was. In 2013 she set up her own shop. No sooner had she hung out her shingle then she sought and received the commission from the Cité Internationale de la Tapisserie Aubusson to weave the 2m by 8m “Door-Rug” that visitors will see, partially hanging, partially flat on the ground, when they first enter the new Cité. Both Bernet and Perrin-Crinière speak of the “relationship of confidence” between the weaver and the artist. “A tapestry is necessarily a collaborative work, a dialogue between the two,” says Bernet. Any regrets about leaving the work of a pharmacist? “No regrets, but working as a lissière with my own workshop requires sacrifice. 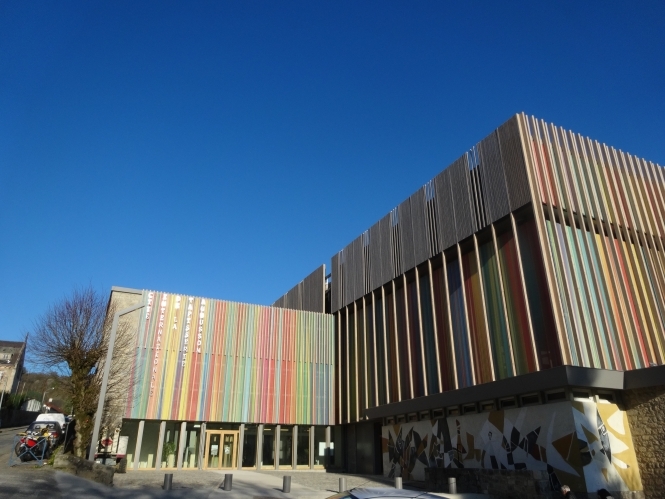 The Cité Internationale de la Tapisserie Aubusson, which will be inaugurated on July 10 is at once a museum, an institution for the transmission of knowledge, a research centre, a start-up incubator for related businesses and a platform for marketing and the creation of contemporary tapestries. 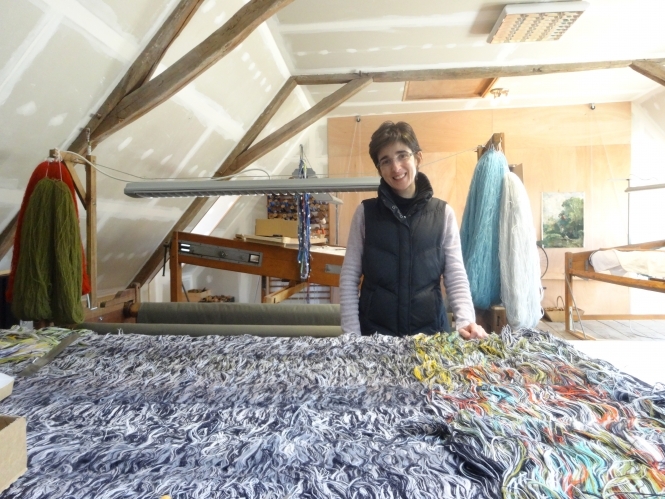 Twelve people are admitted every two years to its two-year programme for budding weavers (lissiers). It will also restore state-owned tapestries in a separate section of the newly refurbished and expanded building. Picking up the baton from an older, smaller museum, the project has been mooted for more than 20 years, but truly began to take shape in 2009 when UNESCO accepted France’s application to place Aubusson’s tapestry-making on the Representative List of the Intangible Cultural Heritage. As a museum, the Cité will display examples of tapestries from the 15th century onwards, including a dramatic presentation of works through the ages a series of theatrical interiors. The techniques of tapestry-making and their use around the world will also be shown. In addition to the commissioned tapestries woven by Catherine Bernet and France-Odile Perrin-Crinière, one of the major pieces currently underway is one for the Centennial of the First World War, a Pietà for World War I comprised of thousands of skills.